Money and Product Quality - How Much Will You Pay for a Better Pizza? Shopping - What’s Really Controlling Us? What Does it Take to Make an E-Shopper Happy and a Credit-Using Customer Buy? So Many Choices ... So Little Time... Which should I Choose? The Economics of Personal Distance: How Many Miles is a Phone Directory Ad Worth? What Messaging Drives a Desire to Invest... or What Should you say About the Company? The readers of this book are in for a treat. They may also be in for a surprise – unless, of course, they are already familiar with the thought-provoking works of the authors. By my reckoning, Eugene Galanter, Howard Moskowitz, and Matthias Silcher together have amassed well over a century of experience in business and academia, the lion’s share of their experience being in the arenas of consumer assessment, product development, marketing, and, notably, psychophysics. Fortunately for the readers, Galanter, Moskowitz, and Silcher have effectively funneled their experience, knowledge, and wisdom into this tour de force on the psychology of economics. People, Preferences & Prices is an innovative foray into the minds of consumers. Over the last four decades, the psychology of economics has emerged as one of the hottest topics in the discipline of economics. The psychology of economics is grounded in the recognition that economic acts are, by their very nature, the outcome of human agency. And recognizing the role of human agency, psychologists and other behavioral scientists have tried, in an ever-growing number of articles and books, to understand how cognitive and emotional processes affect economic behavior. How does our psychological make-up affect, for example, our decisions about purchases and investments? As a consequence of our needs, desires, and values, as well as the ways that we process, store, and remember information, economic decisions can depart from the predictions of traditional economic theory -- an outcome that might surprise, or dismay, some readers of Adam Smith's Wealth of Nations, though not readers of his Theory of Moral Sentiments. In the Wealth of Nations, Smith said that the 'invisible hand' leads all of us to maximize our own wealth, but in Moral Sentiments, he said that the 'invisible hand' leads those of us who are better off to share our wealth with others. The Wealth of Nations, published in 1776, complements the Theory of Moral Sentiments of 1759, written while Smith was Chair of Moral Philosophy at Glasgow University. Both works articulate Smith's views on human nature, though each emphasizes a different aspect of the human psyche: Just as acting from self-interest leads to economic success, and thereby makes us happy, so does acting from sympathy to others lead us to act benevolently toward them, and thereby makes us happy too. People, Preferences & Prices treats the psychology of economics from a unique perspective, one that assimilates the homo economicus, or economic man, of rational economic theory into what I would dub psychophysical man. The term psychophysical man, like economic man, needs to be understood as a collective plural. The term encompasses women as well as men, of course; but it also encompasses person-to-person variations as well as broad and perhaps universal principles of human nature. In order to understand human minds, it is crucial to acknowledge and characterize their Whitmanesque richness and variety -- the differences, large and small, in the ways that people evaluate whatever it is that matters to them, and whatever does not matter. Psychophysics offers both a framework of interconnected concepts for understanding mind and behavior, and a practical set of tools for studying them. In doing this, psychophysics provides an approach as dear to my own heart as it is to the authors'. As Galanter, Moskowitz, and Silcher note, psychophysics is the oldest branch of experimental psychology. The practice of psychophysics even predates the coining of the term by the German physicist-philosopher Gustav Fechner a century and a half ago. Psychophysics deals with what Fechner called the ‘exact science of the functional relations … between the bodily and mental, the physical and psychical world.’ By providing both a conceptual framework and a set of experimental methods to study sensation and perception, psychophysics played a prominent role in experimental psychology during its formative decades during the late nineteenth and early twentieth centuries. But the purview of psychophysics extends far beyond the bounds of sensory perception alone, as People, Preferences & Prices amply demonstrates. Indeed, just a few years after completing his monumental two volumes of the Elements of Psychophysics in 1860, Fechner himself began a series of studies that adapted his psychophysical approach to basic issues in aesthetics. Despite important differences between Fechner’s approach and that of Galanter, Moskowitz, and Silcher, psychophysicists share an important vision about the human mind: that mental life can be examined and characterized in quantitative terms. The virtue of modern psychophysics stems in large part from the fact that it combines its fertile conceptual framework with a wealth of new methods, methods that can be used to show how, in the authors' words, ‘people can act as measuring instruments’. This is to say that people are capable of giving meaningful and useful judgments about the quantitative aspects of their own personal, subjective experiences. Nearly fifty years ago, in a study recounted in Chapter 3, Eugene Galanter asked a pair of questions that are central to the psychology of economics: What is the subjective or mental value of money? How does the ‘utility’ of money, to put it in the language of economics and decision-making, relate to money’s physical value (say, in dollars or Euros)? Obviously, $20 has twice the physical, monetary, value of $10. But does $20 have twice the subjective or psychological value of $10? To address these questions, Galanter capitalized on methods championed by the eminent American psychologist S.S. Stevens -- with whom he, Moskowitz, and I all had the privilege of working, at one time or another, longer ago than perhaps any of us likes to remember. The experimental methods of psychophysics make it possible to quantify underlying mental structures, to reveal the 'algebra of people's minds.' Galanter, Moskowitz, and Silcher are concerned with how people perceive, think about, and choose among the ‘stuff' around them, especially among the products that inundate those who live in relatively wealthy, industrialized countries (a portion of the world's population that, I believe, will inexorably continue to increase in the decades to come). The algebra of the mind expresses mental structures, providing insights into, and templates for, what the authors call each mind's economic genome. 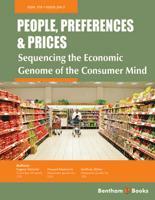 Indeed, People, Preferences & Prices has as its subtitle, Sequencing the Economic Genome of the Consumer Mind, making clear the important role that this biologically-inspired metaphor plays in the authors' conception of consumers' minds. In the biological world, the number of possible human genomes is enormous. Genes themselves come in many varieties, known as alleles, and every human genome comprises a particular combination of alleles of the 25,000 or so human genes (the exact number still being uncertain). Every person has a unique genome (except, with proviso, in the case of identical twins). So too, by analogy, every consumer -- hence, every person -- has a unique mental genome. A leitmotif pervading the book is the authors' emphasis on the use of experiments grounded in psychophysics to identify and characterize subgroups of the population that use similar rules of valuation -- the economic genomes of different segments of the population, such as those who are relatively sensitive or insensitive to the price of a particular product. How far might we stretch the metaphor? After all, genomes in biology have both structural properties and functional consequences. Genomic structures come from the organization of DNA in genes. Genomic functions come from the ways that individual genes turn on or off, thereby expressing or not expressing particular proteins. And some genes turn on and off, through mechanisms not yet fully understood, in response to environmental signals -- a realm of biology called environmental genomics. Recent findings suggest that environmental factors can affect gene expression epigenetically, by biochemically changing the ways that bits of DNA express proteins. Might something analogous take place in the realm of mental genomes? The economic genomes of consumer minds are labile too, capable of adjusting to circumstances. Every mental genome reflects the person's experience as well as biological endowment -- experience and endowment both being unique. Psychophysical experiments can offer not only snapshots of momentary mental genomes, but also videos of the ways that mental genomes unfold over time -- thereby displaying the environmental genomics or epigenetics of the consumer's mind. In the authors' words, all of us are ‘consumers and customers of one or another sort. We all buy, most of us use credit cards, some of us clip coupons, and in the main we're attuned to prices, to value, to the stuff of everyday life.’ Indeed, People, Preferences & Price could also be subtitled Psychology Meets the Stuff of Everyday Life. Where economists analyze the production and consumption of goods and services, Galanter, Moskowitz, and Silcher aim to illuminate why people pay what they do for a can of cola, why they reject the offer for a particular credit card, why they respond positively to one marketing message but not another. Pertinent to the last example, Chapter 8 ends with a recommendation: ‘A good rule of thumb is: have a convincing offer, but try to write it in fewer than 20 words.’ Readers especially interested in marketing may find clear and specific recommendations like this themselves worth the cost of admission. In any case, each of the 27 chapters provides fresh insights into how and why people make their everyday decisions to buy or not buy, or to choose one product over another, whether a soft drink or a credit card. The authors probe the genomics of the economic mind in what is largely the language of everyday discourse. Many researchers on behavioral economics tell little stories or pieces of stories. Galanter, Moskowitz, and Silcher take on a much bigger task -- to tell a comprehensive story about the psychophysical mind of homo economicus. Which of us has not at one or another time heard about the dismal science, economics? If we happen to be ignorant of classical economics taught by professors in universities we have the pundit in the newspapers, the short blurbs telling us of today’s latest economic conditions from a variety of email sources, and of course our friends. The bottom line here is that we all know about economics writ large, macroeconomics. On the more personal level we also know a great deal about microeconomics, the economics of the consumer. We, all of us, are consumers and customers of one or another sort. We all buy, most of us use credit cards, some of us clip coupons, and in the main we are attuned to prices, to value, to the stuff of everyday life. And so that is where this book begins. We have all been schooled in the formal economics of society, in the macro world of governments, inflation, occasional recession, interest rates, trade deficits, etc. The truth of the matter is that those places are not where we live. We, economic man (and woman) live in the daily world, the ordinary world, the world of prices, stuff, services, buying and selling. It is that mundane world of everyday life with which we deal here in this book. There’s one more thing. We are experimenters, psychologists, behavioral scientists. The world we know best is the world of experiment, where the researcher gets to set the conditions, invite subjects (or in our case respondents) to participate, determine the relation between variables we control and responses, and in the end learn something about the mind of economic man. So when you read this book you will get this strong flavor of experimentation. The book deals with experiments. In fact, the book is, in reality, a series of experiments the way a psychologist would explore, even invent economics. We went our own way when developing the topics. We wanted to look at economic man as a psychologist would look at him, not as economist. We don’t propose ideal methods, models of what should be done. Rather, we invite the reader to share with us what does happen under controlled conditions. And in doing so, we invite the reader to learn about the mind of economic man today, as that mind copes with the ordinary, the stuff and activities of daily life. Our book explores a variety of topics that can be called psychological economics. It demonstrates to the reader how to do straightforward experiments, to understand how people think about the economic aspects of their daily lives. We look at how people react to aspects of their daily lives, what drives them to react, what are the issues that are most important, and how do they make decisions. We do so in light of educating the reader ‘how to do these experiments’, what the results look like, what they imply. And then we teach the reader how to apply these ideas for new studies. In a sense we are profoundly educating the reader into ‘how to do Psychological Economics’., not just giving the reader an interesting trip through data and observations. The ‘very hot’ area of behavior economics, which up to now comprises books with short vignettes and descriptions of one-off experiments. These one-off experiments make a good reading, but they do not offer a science accessible to the reader. Methods accessible to the reader, from start to finish, used by commercial researchers as well as policy researchers. These methods make the whole field of behavioral economics approachable by anyone. Rather than presenting data from simple one-off experiments, we present databases that can be understood by the reader, and used as the foundation of the reader’s own work.